Curious about the Beef Chronicles? Read the intro to the series here. They say food tastes better when you are camping. Perhaps it's the smoke from the open fire, perhaps the fresh air that stimulates the appetite, at any rate I chose T-Bone steaks for our recent camping supper, hoping that perhaps Mother Nature would help inject some excitement into this otherwise boring cut. 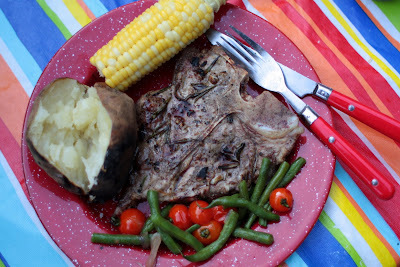 Everything about the family-style dinner was absolutely delicious, from the potatoes that were baked in the campfire ashes to the sweet summer corn, but when I think back to that steak, the words 'best ever' come to mind. 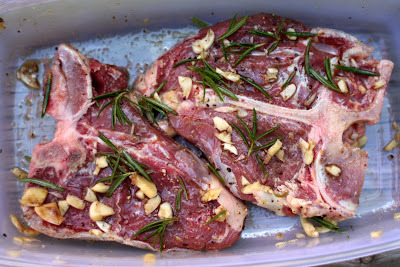 Earlier in the afternoon, while the gang of us hit the beach, the T-Bone marinated ever so simply in olive oil, cracked black pepper, crushed garlic, and fresh rosemary--all ingredients I 'happened' to have on hand on our two-night camping trip. Later it was quickly seared on a portable grill and the result was fork-tender, flavorful steak. This homegrown beef has got it going on. Usually I'll add a squeeze of lemon, especially with poultry, and the herbs can be switched up for whatever suits your fancy. I season the steaks with salt just before grilling. 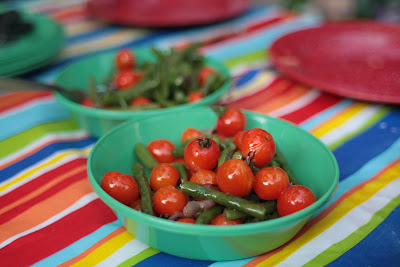 Cherry tomatoes and green beans, both from my potager, were sautéed up for a colourful side, while this juicy tomato salad was prepared on my lap while sitting around the campfire. Tools? A bowl and a Swiss Army knife. I had fresh yellow and red tomatoes from my garden, which I carved up and let drop into a bowl to mix in their own juices. Next I cut up half a red onion (in the same way you would carve an apple and eat it slice by slice) and let that fall into the bowl as well. I tore up a generous handful of fresh herbs -oregano, basil and thyme-, drizzled olive oil over everything, and tossed the salad together with salt and pepper. 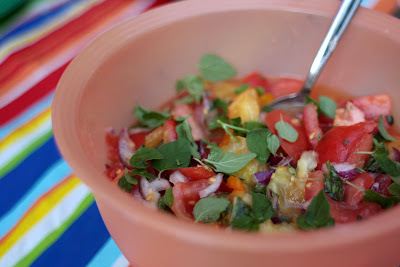 Voilà, summer in a bowl. After dinner I got to work on the S'mores, cranking them out three at a time to satiate the needs of the little campers. For the record, open faced is the only way to go, or else the cracker/chocolate ratio was way off. 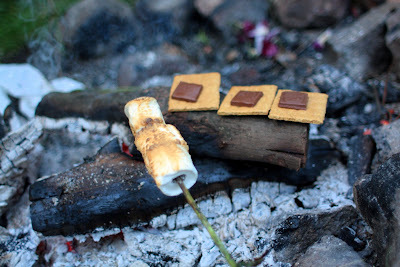 I like having a warm log to toast the graham crackers and warm the chocolate, while I brown the marshmallows. Perfection! Alright, so far the Beef Chronicles have been pretty tame, I'll be the first to admit; however, it's been like 35 degrees all week around here and cooking is a chore in that heat. The Beef Bourguignon is just going to have to wait until the cool fall weather. It's going to be fabulous paired with my ripening squash. Hey! Tomorrow is my birthday! We're celebrating on the weekend, but tomorrow I'm going to go see the much talked about Julie & Julia with my sister. Maybe they'll cook some beef in the movie and I'll get inspired! Looks great! All food IS better over an open fire :) Happy Birthday tomorrow! Hope you have a wonderful day! I used to go camping every year with my family, but we've fallen out of habit of joining along. This makes me want to go back! I love potatoes cooked that way. You've also got me considering buying my own cow. Or however you say it. HA. Wow, that's great camping food!! Have a wonderful Birthday tomorrow. I hope you will enjoy the movie - I loved it! PS - don't feed the liver to the cat! I have a wonderful recipe for Italian liver I can give you - it's a favourite in this household. They DO actually talk about beef in the movie! You'll love it! Happy Birthday to you! I'm excited about the beef chronicles; we've got a freezerful ourselves. I'm all ready for the winter roasts, but I'm not really excited about all the steaks. Thanks for the ideas. This looks wonderful. I have to agree that food made while camping is some of the best ever. My husband and I live on an acreage, so we escape to the fire pit in the backyard - sometimes for the whole weekend - and cook all our meals there. We actually have a grill that we place over hot coals in the fire. Eggs cooked in a cast iron pan, with bread grilling on the grill, along with some prosciutto. Mmm. Happy Birthday! I love that salad! 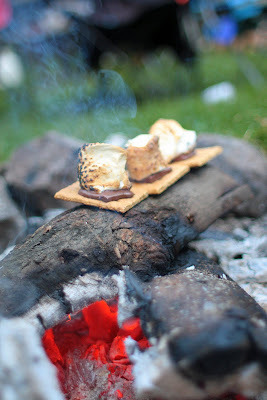 I posted S'mores cookies today:) I like the open faced idea. I love that little salad. It looks so dainty. This makes me want to go camping! Happy birthday - I hope it's a wonderful one!! Can I go camping with you next year? I found your site last summer and a friend and I were drooling over your camping food. Happy Birthday!